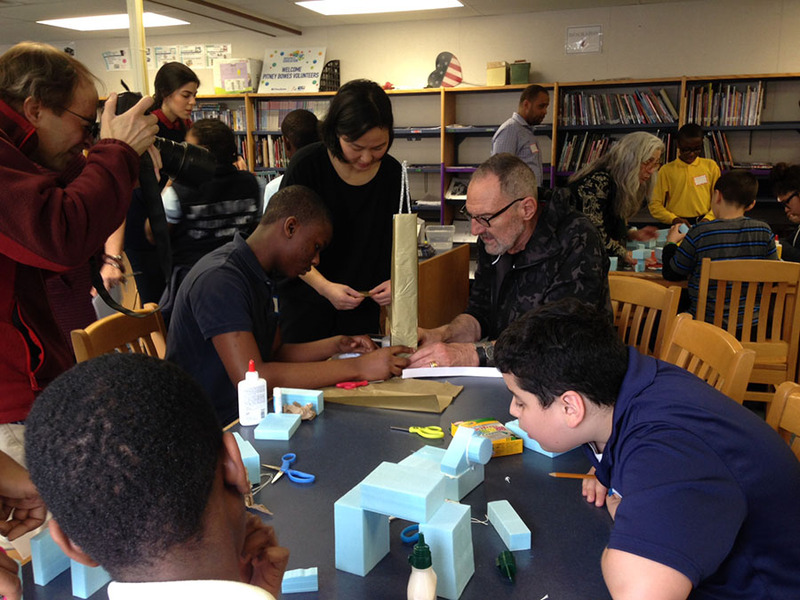 Thom Mayne, an award-winning Los Angeles-based architect, is a Turnaround Artist working with children from Hall School in Bridgeport, CT as part of the HMA Peer Docent Program. BRIDGEPORT, CT - The Housatonic Museum of Art (HMA) has received a $15,000 Art Works award to support its HMA Peer Docent Program. The award is part of over $82 million approved by the National Endowment for the Arts Chairman Jane Chu to fund local arts projects and partnerships. The HMA Peer Docent Program introduces Bridgeport middle school students to art and art history, teaching them to look at art critically and guide classmates during tours. The grant will allow HMA Museum Educators to train ninety students to be docents who will guide 600 classmates on tours of Downtown Bridgeport, CT. Through the program students develop visual, analytical and critical thinking skills that will assist them across academic disciplines and throughout their lifetimes. The National Endowment for the Arts Art Works category supports the creation of work and presentation of both new and existing work, lifelong learning in the arts, and public engagement with the arts through 13 arts disciplines or fields. The HMA Peer Docent Program is in its fifteenth year of successfully introducing Bridgeport students to art and architecture in their communities and throughout the region. 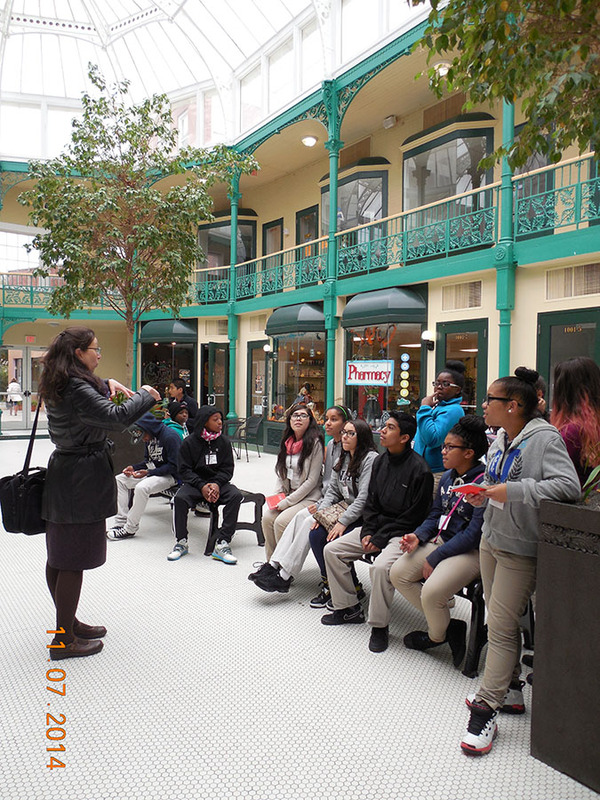 Janet Zamparo teaches peer docent students inside the Arcade Mall in Bridgeport, CT. The Housatonic Museum of Art was awarded $15,000 from National Endowment for the Arts, funding a fourth year of the HMA Peer Docent Program. Additionally, this year’s program has enlisted award-winning architect Thom Mayne. Originally from Waterbury, CT, Mayne is a renowned architect, and a Turnaround Arts Initiative Artist. Mayne will be working with Hall school in Bridgeport. The HMA Peer Docent Program is a nine-week arts enrichment program providing Bridgeport middle school students with an opportunity to use object-based inquiry to practice observing, questioning, discussing, and learning about art and ideas. The program consists of six school-site training sessions, two field trips to the HMA where Museum Educators model docent training, and eventually where peer docents lead their classmates on tours, as well as a third field trip to another historically significant architectural site. The HMA utilizes its permanent collection to enhance the Program, which is modeled upon Harvard University’s Project Zero’s Guided-Inquiry Method and sub-program Project MUSE (Museums Uniting with Schools in Education), and the Aldrich Museum’s Peer Docent Program. The Housatonic Museum of Art (HMA) is home to one of the premier college art collections in the United States. Its collection offers students and the community alike the opportunity to view works that span the history of art from the ancient to the contemporary. Unique to the Housatonic Community College campus, this permanent collection is on continuous display throughout the 300,000 square foot facility, offering a rare opportunity for both art enthusiasts and casual observers to view and interact with the art on a daily basis. Visit www.hcc.commnet.edu/artmuseum/ to learn more. The Housatonic Museum of Art is funded in part by the Werth Family Foundation, Fairfield County’s Community Foundation, Institute of Museum and Library Services, National Endowment of the Arts/Art Works and individual donors.